While Seed does not need a build spec to configure your pipelines or your project, there are cases where you need to run some scripts during the build process. You can get a sense of the different build steps by looking at one of your build logs. To hook into the build process, add a seed.yml in the root of your project directory. Here is the basic skeleton of our build spec. Below is a brief description of when these commands are run. Seed starts the build process by doing a npm install (for Node.js projects), pip install -r requirements.txt (for Python projects), or make (for Go projects). The before_compile step let’s you run commands before this. This can be useful for configuring private npm modules. This step is not run when a build is promoted to production. 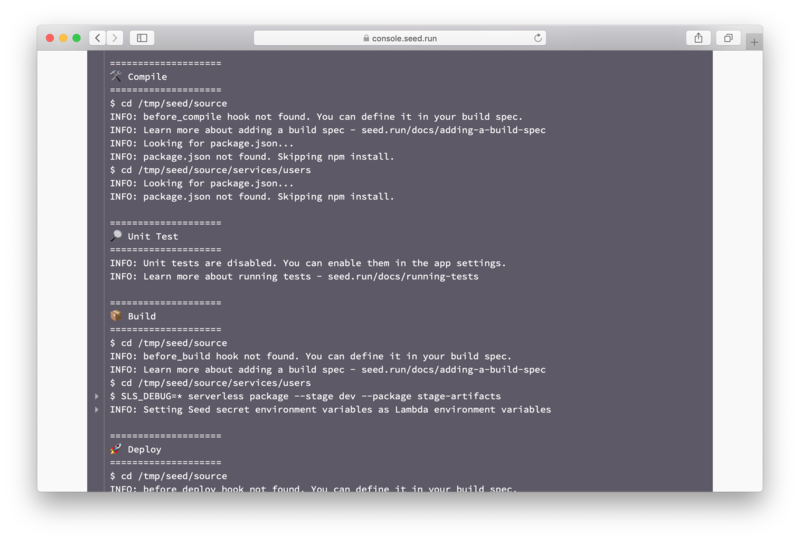 The actual build portion for Seed is the serverless package command that creates the build. The before_build step let’s you run your commands before this happens. This step is not run when a build is promoted to production. After the build packages are created, Seed deploys these using the serverless deploy command. The before_deploy let’s you run your commands before this happens. This step is run for all builds and also when they are promoted to production. You can distinguish between the cases by using the $SEED_STAGE_NAME build environment variable. Finally, after the deployment is complete you can use the after_deploy step to run any post deployment scripts you might have. Again, this step is run for all builds and also when they are promoted to production. You can distinguish between the cases by using the $SEED_STAGE_NAME build environment variable. Seed also has a couple of build environment variables that you can use to customize your build process. These should not be confused with the secret environment variables that are defined in the console. $SEED_STAGE_NAME: The name of the stage that is being built. The stage names are exactly as shown in the console. $SEED_SERVICE_NAME: The name of the service. Secrets: All your secrets in the Seed console are also made available during the build process. For example, a secret environment variable called TEST_VAR would be available as $TEST_VAR in the build process. Here the $SEED_APP_NAME would be serverless-app, $SEED_STAGE_NAME would be dev, $SEED_SERVICE_NAME would be users, and $SEED_BUILD_ID would be 32. You can use these build environment variables to customize your build process. Here are a couple of examples of what you could do with them. Let’s assume your production stage is called prod. Let’s assume your service is called users.